The warm summer weather always takes a toll on my feet-especially, my heels. I sport sandals all summer long, so with the constant exposure, my feet become stubbornly drier and rougher than normal. My usual foot creams just weren't cutting it anymore, and my feet longed for something stronger that would produce positive, effective results. In comes the ecoTools Love Heels All Intensive Heel Cream (I got this at my local Lot Less Discount Store for $1.99). Boy, am I glad I found this heel cream because this stuff works! ecoTools gnarled a cult-following thanks to their amazing and affordable, makeup brushes. Since then, ecoTOOLS has expanded their line by coming out with a variety of body/skincare products that contain that natural eco-friendly trait, which ecoTOOLS is known for. This heel cream being no exception. The texture of the cream is on the thicker side but it easily blends into the skin, with very little effort. There is a comforting peppermint fragrance in this cream, which I actually quite enjoy. I find that the peppermint imparts a cooling and refreshing sensation to my feet, which just makes the application process that much more enjoyable.The peppermint scent dissipates after awhile, so it doesn't linger on for too long. I use this heel cream morning and night, and my feet have never looked or felt better. The dryness disappears, and my heels soften up significantly. This stuff sinks into my skin almost instantly, so it doesn't leave behind a slippery or uncomfortable residue, which is a huge plus. Overall: This heel cream from ecoTOOLS is simply amazing and I can't rave about it enough. It's just what my parched-for-moisture feet needed to get through the summer. Summer is long gone over here in my neck of the woods, but I have no doubt that this heel cream will work just as great for the colder, winter months coming ahead. I have a feeling that this product may have been discontinued because I don't spot it on the ecoTOOLS website. If it has been, I lament not picking up a few extra tubes of this heel cream while I was at Lot Less *sigh*. But if any of you come across this heel cream and your feet happen to need a little pick me up in the hydration department, don't hesitate to give it a try. This gem surely won't disappoint. 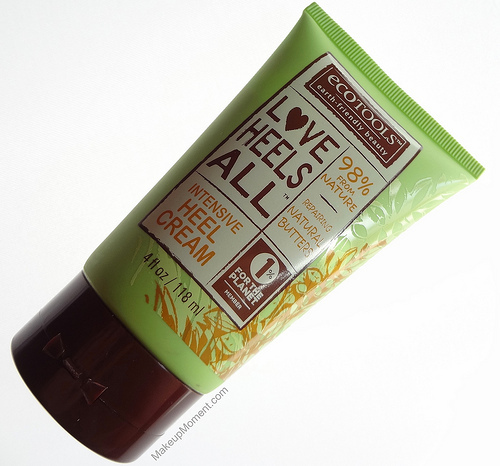 What do you all think of the ecoTOOLS Love Heels All Intensive Heel Cream? Which are your favorite foot creams?